NOTICE: Activation key must be used on a valid Steam account, requires internet connection. ABOUT THE GAME	Non-stop space action awaits you in this arcade style tower defense game. Manage the defenses of the Freedom Strike starship – humanity’s last hope for resisting invading alien spaceships. The year is 2170. One after another have human colonies fallen to the seemingly limitless inv… asion force of the enigmatic organic ships known as the Wrog. Whole armadas of Earth's fighters have been decimated. Our last hope lies with the Freedom Strike, a massive super tech battlecarrier, fitted with interchangeable turrets, a fleet of specialized drones, and designed for one goal: to annihilate the Wrog and save our species. 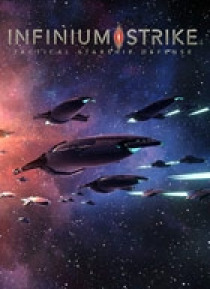 Infinium Strike is an original tactical defense game where you are the weapons officer on Freedom Strike. By scavenging and utilizing Infinium – the living metal of the cosmos – you create powerful turrets and deadly drones in order to turn the tide of the Wrog war. Can the mega battlecarrier Freedom Strike survive the waves of relentless Wrog enemies?KEY FEATURES	Full story campaign with four levels of difficulty Endless arcade mode with high score leaderboard Wide variety of tactics using turrets, drones and SuperTech abilities Immersive realistic 3D graphics	Career advancement – from Ensign to Admiral	SYSTEM REQUIREMENTS WindowsMINIMUM: OS: 7/8/10, 32 or 64 bit Processor: 2 GHz Duo Intel/AMD CPU Memory: 2 GB RAM Graphics: GeForce GT 430, Radeon HD 5400 or HD4000, 1GB VRAM; 1280 x 720 resolution DirectX: Version 9.0c Storage: 1 GB available space Sound Card: Windows compatible sound Additional Notes: 2-button Windows mouse with scroll feature, full controller support RECOMMENDED: OS: 7/8/10, 32 or 64 bit Processor: 1.8 GHz Quad Core Intel/AMD CPU Memory: 4 GB RAM Graphics: GeForce 560, Radeon 7850, HD4600 or higher, 2GB VRAM; 1920 x 1080 resolution DirectX: Version 11 Storage: 1 GB available space Sound Card: Windows compatible sound Additional Notes: 2-button Windows mouse with scroll feature, full controller support MAC OS	MINIMUM: OS: 10.8 Processor: 2 GHz, Mac 2010 Memory: 2 GB RAM Graphics: NVidia GeForce 430 or AMD Radeon 6850 1GB VRAM; 1280 x 720 resolution Storage: 1 GB available space Sound Card: Mac Compatible Additional Notes: OpenGL: 4.1, 2-button mouse setting, full controller support RECOMMENDED: OS: 10.10 or later Processor: 1.8 GHz Quad Core, Mac 2012 Memory: 4 GB RAM Graphics: NVidia GeForce 560 or AMD Radeon 7850 2GB VRAM; 1920 x 1080 resolution Storage: 1 GB available space Sound Card: Mac Compatible Additional Notes: OpenGL: 4.1, 2-button mouse setting, full controller supportSteamOS + LinuxMINIMUM: OS: Debian, Ubuntu, and Fedora 14.04 or higher Processor: 2 GHz Duo Intel/AMD CPU Memory: 2 GB RAM Graphics: Geforce GT 430, Radeon HD 5400 or Intel HD 4000, 1GB VRAM Storage: 1 GB available space Sound Card: Linux Compatible Sound Card Additional Notes: 2-button Mouse and Controller Support RECOMMENDED: OS: Debian, Ubuntu, and Fedora 14.04 or higher Processor: 1.8 GHz Quad Core Intel/AMD CPU Memory: 4 GB RAM Graphics: GeForce 560, Radeon 7850, HD4600 or higher, 2GB VRAM; 1920 x 1080 resolution Storage: 1 GB available space Sound Card: Linux Compatible Sound Card Additional Notes: 2-button Mouse and Controller Support © 2016 1C Company. Developed by Codex Worlds Corporation. Infinium Strike (copyright) and Codex Worlds are trademarks (TM) of Codex Worlds Corporation. All other names and products are trademarks and/or registered trademarks of their respective companies. Infinium Strike (copyright) Codex World Corporation 2016.